That is pretty cool and a lot of work Octravera. Lovely. Thank you for sharing with us. A street-wise, adventurous, and bubbly desert nomad who was involved in Duat’s rebellion cause that sought to rid the town of Sek-Duat’s rule. He despised tyranny and wanted to do everything he is able to handle to wipe it out of the Sandsea. As a baby, he was forcibly taken from his biological family by bandits who are mortal enemies of the Oasis Defense Force, the predecessors of the Duat’s rebellion made up of Sandsea Guardians that were wiped out by Sek-Duat several hundred years into his conquest for eternal life. Although he was never aware of his true heritage, Crulon grew up believing that he belonged with the bandits and became used to hardship due to his habitual stealing and disregard of the law, indicating that he is naïve when introduced to regulations, but he means well. One blistering hot day, he was finally caught stealing from a merchant and he ran away before he could be apprehended. He was found by a fourteen-year-old boy who seemed like he was from a middle-class family and immediately recognized him as the bandit that stole from his favorite stand. Instead of alerting the marketplace, the boy could tell that Crulon was ignorant and sought to teach him that stealing from people is immoral. The latter quietly abandoned the bandits who raised him and his friendship with the boy eventually led to his involvement with the rebellion to make up for his past transgressions and become increasingly aware of why laws are necessary, but only if they are corrupt and heartless should it be appropriate to fight back. Crulon felt a lot better about himself in the process and became wiser and experienced, leading him to eventually stop stealing entirely. Unfortunately, for him, his enthusiasm quickly turned to uncertainty when the Rose stepped in to help the rebellion cause and ultimately brought peace to Duat even though Sek-Duat was never caught for some time. Morally conflicted about what he had overheard about the Rose from those who favor magic who visit the city and gossip in secret, Crulon wonders if the cult’s assistance came with a cost that the rebellion had overlooked. With heavy heart, he slowly reverts to a state halfway between his enlightened personality and his former status and started to snoop on Rose officials stationed outside the layout and parameters of the pyramid, looking for untold secrets to leak to the now-grown boy that brought him into the cause in the first place. Back when I started this project last August, I didn’t think I would finish it because a variety of obligations and key projects came up, but I was fortunate to pull through once I realized that I shouldn’t give myself more work than I can handle and took the design process one step at a time even if some of my sketches came out undesirable at first. My take on Crulon in the DragonFable timeline began when Crulon and I became good friends because of the way we both looked at life and our own thought processes. I designed much of Crulon’s appearance such as his clothing, his hair, his shoes, and his scarf while Crulon was kind enough to provide me with additional assistance. While I overdid the texture on the desert pants at first, Bido ultimately helped me emerge from that obstacle when he redesigned its appearance and I am thankful to be able to take the project as another learning experience that will continue to help me overcome my weakness with designing clothing. 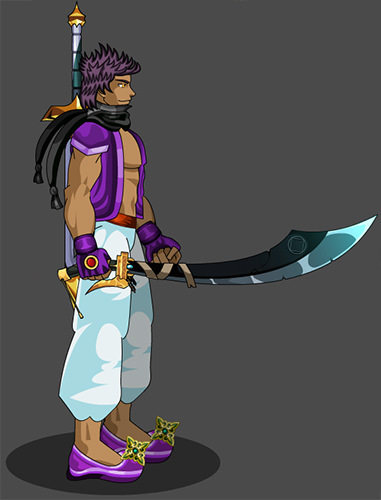 Furthermore, the item descriptions for Ebon Blade of Sands and the related item sets that Crulon drew in AQW’s Featured January Gear immediately snapped me out of my writer’s block when trying to come up his background in DragonFable, which was slightly difficult for me because he is not directly involved in Occavatra’s backstory because he has not traveled to the Sandsea with his company until around mid-Book 2 shortly after Europa gladly decided to come with him. The Djinn Warrior Blade that Crulon has sheathed was said to be acquired by a ManaHunter under Magus Hansa's supervision. She assumed it was mistakenly abandoned by an “otherworldly being that carries a great deal of white magic” during the attacks that threw the elemental realms into disarray. It was intended to be used for further study up until Crulon stole it. How he managed to do so without getting caught by the Rose remains to be seen. Forged from an elegant shaft, scrap metal, and two functional gears found in the remains of Popsrocket, this scepter relishes in magiscience while also bearing an ancient warning of what is to come if the Mana Core is tampered with. Guard it with your life if you must. When I started my design process for this staff, I was at a loss of what its appearance should be because I intended it to be Vivi’s personal weapon. In order to get myself inspired to draw, I looked up a Q&A post in the MechQuest Design Notes where Vivi answered an assortment questions, I came across one that asked what house would he be in where the answer was “Runehawk, probably.” It was at that moment when I thought to myself that the weapon should be Runehawk-themed and it must be a throwback to MechQuest. The entire design is two-dimensional save for the cube that floated on top of a piece of a circular blade that is one of the pieces of scrap metal that comprised the weapon. The design process for the cube was definitely the hardest aspect of putting this staff together (Thanks for the pick-me-up on the texture placed on its sides, Ergotth.) because I never attempted to create a three-dimensional object in Flash before. It took a bit of trial and error for me to realize that gradients and what I had originally planned was not going to come out nice when I finish it so I worked with solid shades of blue instead and applied it to the rest of the staff to keep it cohesive. I added the hawk heads from the Blazing Phoenix staff on the Runehawk chassis to each side of the cube while I placed an orb and recolored Short Swords on top of it to represent a possible clashing that might occur near the Mana Core. I erased the lines on the heads and added my own gemstone to give them their glowing eyes, which I thought gave off a mystifying vibe. Designing the gears using references from a screenshot that I took of existing assets found in Popsrocket as well as some real-life images that contained aspects of lighting and shading was the second most challenging aspect of putting together the weapon. The reason for that difficult was that the lighting was all over the place on some of the references I found, but I was fortunately able to come across one that was easier for me to work with and learn from. When I finished the gear’s appearance with a tip from Bido regarding how it must appear, I designed another piece of it to add in its center and was able to perfect it enough for it to come out nice. Afterwards, to conclude the design process, I added minor tweaks to the staff’s appearance yesterday morning to fit the two gears in the weapon and added animations to them as well as the cube, allowing the three objects to rotate using motion tweens. I created the Arcane Cube of Kismat to say thank you to Vivi for being an understanding and good friend to me that I am fortunate to be acquainted with since MechQuest stopped receiving updates. I hope that you all enjoy viewing this nostalgic masterpiece. Vivi is an inquisitive, veiled sorcerer with immense knowledge of the natural world and a young man whose origins are shrouded in mystery. He is known to bear knowledge of a long-forgotten past that only a select few recall in the deepest areas of their subconscious. Although considered a laughing stock to Falconreach’s illiterate citizens due to the stories he tells without the need of a manuscript, he is rarely emotional and his skin is thicker than stone. He does, however, open up to those who are willing to listen and be able to understand him. Vivi believes that magic and science are one and the same because he considers magic “a branch of science that nature created while average science is man-made.” To him, both aspects of power make no difference and as a result of his down-to-earth preferences, he has the two coexist harmoniously with one another to tap into his potential as a mage with a fondness of technology. That power and knowledge of the past in addition to the natural world has helped him hold his own against both powerful organic and mechanical enemies alike even going as far as being able to contend with Dr. Voltabolt’s contraptions with little strain. As an ally and a friend to the curious and enlightened, Vivi keeps a mental tab on behavior from other people so he would know who to avoid and watch out for. He is selective of who he share his secrets with, let alone who is willing to take him seriously, however, once he knows who his friends are, he is revealed to be loyal, understanding, and helpful to them. This side of his personality causes him to be one seemingly-anonymous sorcerer to possess a heart of gold. Vivi’s NPC was designed using a recolored version of the Mage Robes, a blue recolored version of the Red Scarf, and Vivi’s Birthday Hat. The latter is a head item that was available in MechQuest during Vivi’s birthday on a couple of occasions, but it is no longer obtainable as of now. My inclusion of these assets was to create a DragonFable vibe while adding in an allure of mystery because his body is covered in shadow even in broad daylight. I added modifications to the orbs on the robes by adding my own that I made recently as well as designing the Arcane Cube of Kismet, Vivi’s personal weapon. What started out as a simple approach became a learning experience that was nostalgic to me and some players when I had posted my works-in-progress and wrote a caption to advertise MechQuest over the weekend. The amount of love and passion for the game that was expressed in replies to my tweets was touching and it helped me realize furthermore that I am not all alone. Much like the Arcane Cube of Kismet, I gave Vivi his own NPC to thank him for being a good friend by helping me keep my head up in a tough time I went through when I was still new at Flash around two years ago. To this day, it still means a lot to me. Several G.E.A.R.S. students on the dean’s list who are members of House Runehawk approached their head, Jaania, to request permission to locate and research a source that is used to power their machines in order to gain a stronger understanding of magic. While much of their house is preoccupied with solving the mystery regarding where the dragons have vanished following their ancient struggle against the Shadowscythe, she authorized the project under the condition that they only observe the source like a hiker would when they see an innocent forest bear from a distance. Even though Jaania knows little about this source of power, all she is aware of based on her current knowledge of mana is that its source, henceforth known as the Mana Core, can be extremely volatile if desecrated too severely. These students kept their word over the course of their research by taking notes from their observations of the source’s mysterious patterns and the effects it has on its surrounding environment, but not all was well during their visit. Some students save for three who remained level-headed the entire time experienced behavioral changes that rendered them unable to continue. They became too eccentric, giddy, airheaded, and in extreme cases, insane. The research had to be put on hold in order for the three students to keep those that had been mentally lost under control and progress had not been made when the behavioral changes became severe. Upon the party’s return to Soluna City, many students involved with the research had to undergo individual mental health evaluations in the Specific Hospital. Those that failed were hospitalized immediately and they underwent physical therapy. Only a quarter of the student research team, including the three that proposed it, narrowly passed and returned to Jaania with notes that they had taken in the Mana Core during their time observing it. Needless to say, the house head was bedeviled. She swiftly ordered the research project to be discontinued because of the potential danger that prolonged exposure to the core’s energies might cause. She also made the three key students promise to never discuss it to the general public for she fears that individuals with ill intentions might use that research in a vain attempt to control the core only for it to cause disastrous results to the world. They kept their word without question and shelved their notes in a hidden file cabinet in House Runehawk’s sanctum. These students bore the names Occavatra, Vivi, and Winifred whose haunting memories of their experience observing the Mana Core would follow them even after the Reset. The students involved that fell into insanity were fully recuperated three weeks after they were admitted to the Specific Hospital. A technopathic art student involved with the research project lamented what took place in the late stages of the visit to the core and became gravely concerned that its raw power might be the center of a large-scale conflict in the future. Believing that such an event is inevitable based on his intuition; he sculpted the Arcane Cube of Kismet using his gift to express the pounding fear that keeps him up at night. He presented his cube and findings in one of his classes against Jaania’s wishes the following day and was expelled from G.E.A.R.S. University that afternoon. The cube had become property of House Runehawk following the incident until the Reset occurred and was rediscovered by Vivi near Falconreach not long after the Elemental Dissonance had taken place. 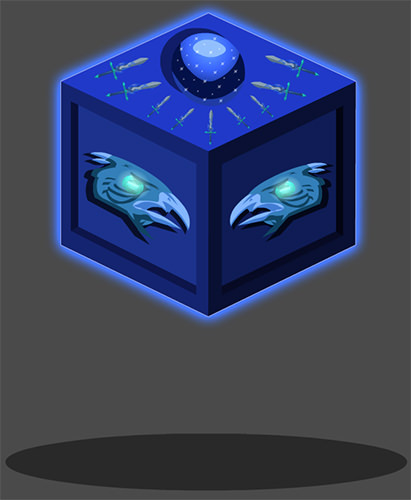 Since then, this ominous cube significantly enhances Vivi’s ability to manipulate both magic and science alike. It, unfortunately, does not specifically state who would be fighting over the Mana Core and for what reason because select students from House Runehawk that traveled to the site kept their research on this supernatural phenomenon strictly confidential as demonstrated by the cube creator’s expulsion and the Specific Hospital’s agreement with the house not to disclose the conditions of those students who were admitted due to exposure. Only effort that resistance groups such as the Vind puts into their struggle to hinder the Rose will tell if the prophecy carved on the cube will come true. In conclusion of the cube’s stand-alone summary, besides several known NPCs in the world of DragonFable, Occavatra, Vivi, Winifred, Irene, Europa, Eonaleth, Maegwyn, Seth Juron, Microsoftie, and the son of one of Falconreach’s guardians also retain memories from the era of machines prior to the Reset. Occa’s own memories have played a crucial role in shaping his current personality and how he interacts with others in the DF timeline. Maegwyn lives in an isolated civilization in a large thicket near The Shears where she works full-time waiting tables. The civilization is made up of advanced objects and artifacts that survived an event that a select few refer to as "The Reset," and Mae remembers the era prior to the event like a walking encyclopedia. She is a remarkable, selfless young woman who looks after the young children of refugees hiding from The Rose and magical creatures in their juvenile stage as their nanny, but her background was not as humble and carefree as it appeared. Maegwyn carries a heavy burden that caused her a great deal of strife. Though it bothers her dearly, she did not let it interfere with her job as a waitress and looking after the younglings. 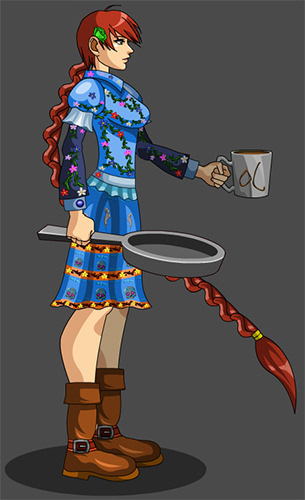 She carries a frying pan with her just in case she is forced to knock an undesirable individual upside its head and a cup of cappuccino coffee to help her get through the day. Rumor has it that it is the very cup that perpetrated The Reset in the first place. The design process for my take on Maegwyn in the DragonFable timeline helped me work on my weak points further and it brought back fond memories of playing MechQuest back when it had received ongoing updates up until late 2015. Instead of designing a side view version of Mae’s attire, I went with designing a nature-themed post-colonial styled dress with the colors on her original outfit and her iconic half-circle ponytail intact. The latter was difficult to pull off because there wasn’t much to see on the front view and it took me several attempts to piece together the braids into a smooth curve based on the way I envisioned it. I would like to thank my clan-mates in the Beacons of Hope (particularly whitetigress, Gingkage, and Starflame) for their feedback and offering tips that gave me a boost out of this struggle. The flowers that decorate Maegwyn’s dress and sleeves were bright recolorations of those that flourish in Soluna City during the spring so the symbolic patterns on each color would stand out much better as well as express my sorrowful yet hopeful feelings about MechQuest’s current state. This brings me to the plant-covered skull pattern that I placed at the bottom of the dress. Although it was made from existing assets, I recolored most of them before I decorated the skulls with pink flowers eyes, vines, and a gray-colored plant that is growing on the left side of three of the skulls on the top of the skirt portion of the dress. Why are these skulls included on the dress? What do they represent? There are multiple meanings behind this symbol, but I’ll give you mine. Nothing is ever truly gone even after their time is up as long as they are remembered for years to come just like how a select few remember the MechQuest era even after the Reset. A wise spirit of the earth once told me that when one door closes, another one opens. Sometimes an ending can lead to a stronger beginning to a new chapter. Lastly, I designed leather boots once again by taking a simplistic approach with Hollow’s feedback in mind and the finished product came out splendidly my previous pair of boots when I designed Irene because the texture was cleaner and graspable. As a throwback to the MQ main storyline finale, I decided to include the infamous cup that apparently spilled cappuccino on the machine that would’ve returned the universe back to the way it was, but instead its data got corrupted and in the process, set it back to five millennia. While the cappuccino stains remained in a ship that Castle Nostromo was built upon, Maegwyn kept the cup after venturing within the castle walls herself at the time the Hero was hunting for the Orb of Light with Zhoom. Nowadays, she brews herself a cupful of the steamy coffee every morning to keep her mind relaxed and focused while she’s at work at the civilization’s diner. The group of otters that frolic in a river located in between The Shears and the former site of the Oculus Tower are docile creatures for some can swim up to a visitor and encourage them to swim and play "Paw Fishing" or competitively swim with them. The object of the former game is to catch the most fish by using only bare hands or the mouth without letting any of the fish caught jump back into the river. The winner of each game is given a basic brown sentimental rock found beneath the river's surface. Visitors must be wise enough to accept their prize or else the otters will become less trusting. Sometimes, however, there might be unexpected bombshells in these prizes. For example, during the winter, one winner of one of the otters' games was actually given an earth crystal that contained some of Geopetal's power because it was mistaken for an ordinary rock. Like many otters in the world, their diet primarily consists of freshwater fish and small amphibians, yet if food gets too scarce during the autumn, they might resort to eating birds or small mammals while retaining their playful personalities. The river otters rarely depart their natural habitat, but starting from when the Oculus Tower had been under construction, many of these creatures have been vanishing for unknown reasons. An isolated village that's close to the river speculates that rumors of the Rose recently kidnapping non-magical creatures might be the reason for these disappearances. Other travelers believe that a rise of adventurers in the Greenguard Region have scared most of them away. Despite possibilities that both theories could be correct, a quarter of the overall river otter population prior to the Oculus Tower's construction continues to thrive in the area. I had enough time today to design a scenario where Maegwyn met an otter at the river in between The Shears and the Oculus Tower near her hometown. There, she befriended him immediately and they became inseparable companions. While Mae was in no mood to frolic with the other otters, she did not dismiss the attention they gave her. As an experienced hiker, she was not uncomfortable with getting her boots soaked or drenched in mud from time to time as shown as she stuck her feet in the water without taking them off to talk to her newfound friend. That was when Maegwyn discovered that she has a gift. To others, all they could hear were short, mild squeaks whenever otters made a sound, however, Maegwyn can hear them speak in human tongue and otters can understand her. She was at first astonished and shocked by this revelation at first, but she happily wasted no time putting her unusual skill to use by gathering the group around to talk to them about her experiences as a waitress in her hometown's diner and regaling them with stories about titan-sized machines and advanced technology that are rarely seen nowadays. The otter that stuck to her was fascinated with her stories and lifestyle so when it was time for the young woman to return home before sunset, the otter tagged along and they lived together since that day. 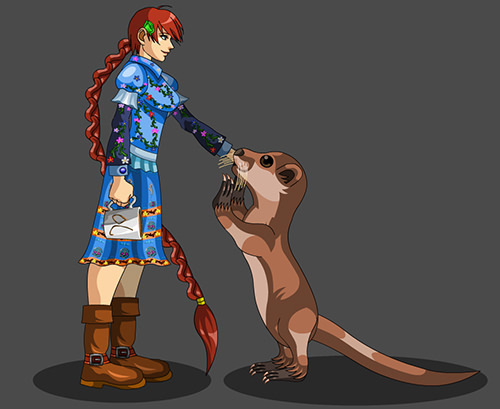 Maegwyn named the otter, "Aaron Charon Wilbur," after an old friend she knew from the era prior to The Reset or "ACW" for short. The otter spends either most of his day as Maegwyn's animal companion looking for relics that survived The Reset to add to the isolated village or assist his friend at the diner when it is one waiter or staff short. Sometimes he can even get into mischief by smearing ink on the customers or the townspeople, which can cause Mae to secretly laugh so much that her eyes would water. What started out as a simple, touching moment became another learning experience regarding natural posture and I have my Beacon of Hope clanmates to thank for that. Unexpected feedback can pop up at me, but learning from them helps me grow stronger as an artist overall. It was a humid summer after the Mysterious Stranger was vanquished by the Hero of Falconreach in a climactic showdown when Occavatra, Irene, and Myron went on a quest to look for the missing Ultimate Orb shards that were scattered in the Maguswood Region. Irene and Myron went off to get water nearby when Occavatra decided to wind down on a rock under a tree because his feet started to hurt. The afternoon sun was high in the sky, gazing down on the planet for the first time since the Mysterious Stranger consumed it. Secretly, the night was the way he liked it, but he knew well that opposites must coexist for there to be balance. A half-hour has passed and Irene and Myron were still out trying to fetch water. Occavatra began to grow anxious. The pond was a short walk from where he was standing and he could've checked on them if he wanted to, but he knew his compatriot can handle themselves. He did have one question that sparked in his head; what is keeping them occupied? To pass the time, he conjured a fireball in his hand and played catch with himself by tossing the flame back and forth in both hands. He smiled because he finally found an activity to occupy himself even if it meant playing on his own. Five minutes into his solo game, a celestial wanderer that hiked through the woods found him in the area. Excited that he found another living soul, he approached him quickly. "I'd extinguish that flame if I were you." he said with a smirk on his face. Occavatra was quick to put out that flame and hide his hands behind his back, embarrassed by the remark. "But what for? I've always been mindful with my magic." He replied. "Well, it's because a couple known pyromancers became power-crazed maniacs that put cities and possibly the whole world in danger." the celestial wanderer said. "Their victims are still traumatized to this day and because fire is not easy for even a skilled mage to control, that type of elemental magic is a sensitive topic." Occavatra lifted his head down, thinking that others will perceive him this way. He sheds a couple tears from his left eye socket and they land on the grass. "It's not news to me, sir." He softly spoke. "I've heard about them and I met one of them. You only just met me so how would you know I'll turn out that way?" The celestial wanderer softly smiled. "I'd like to know you." he replied. "It won't hurt to find out, but I know already that you're awfully quiet and if I'm not mistaken, kind-hearted." Occavatra sniffled and continued to stare down at the ground, but it did not deter the stranger who reached his hand out for him. "My name's Bido." he said. "What might your name be? Come on, you can tell me. I won't bite." Occavatra took a deep breath and lifted his left arm. The tears stopped, but he still felt a little uncomfortable thinking that he might hurt him by accident. "It is Occavatra. It's a pleasure to cross paths with you." He stood up and shook Bido's hand, a gesture that marked the beginning of a friendship that cannot be easily broken. 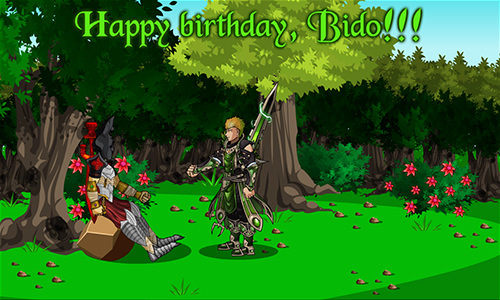 When Occavatra looked at Bido's face, he began to gently smile as well. I put together this background yesterday by recoloring a variety of existing assets including the flowers on the Trollola Plant which I placed on two green bushes in this area of the forest while Bido drew his own NPC in the DragonFable style several years ago as a commission. I later added him to the background when I finally decided where he would fit in Occavatra's backstory which would be around the time Book 1 concluded and Book 2 was just beginning. The background is my gift to Bido to celebrate his birthday and my friendship with him. Happy birthday, man. Thank you so much for everything you've done for me and vice versa from receiving feedback from you on my works-in-progress and finished products to being one of my best friends. I wouldn't trade our friendship for the world. A wand that can call forth destructive rocks within several feet from its caster to save it from even a DoomKnight's wrath. 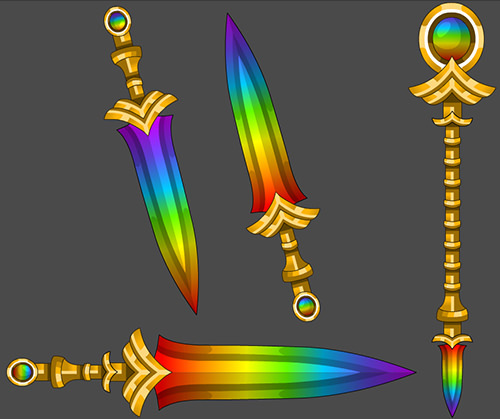 Forged by Dragonlord Occavatra with some consultation from Seth Juron to honor geopetal's legacy in DragonFable. Looking back at last year when I first designed this wand, I was not happy with how the rock and crystal turned out so I redrew them earlier last week using a photograph I took of one of my rocks and images of double-pointed crystals as my references. I thought the texture on the floating rocks was going to be awful when I finished them so I modified the texture a bit with an additional reference so it would come out nicer. When I zoomed out to get a good look at the rocks, my perspective of it changed and I thought to myself that maybe it isn't too bad after all. I took a simpler approach with the double-pointed crystal and I added two more additional branches to the top of the wand so it looks as if the branches are clutching the crystal like some kind of hand. I also removed the additional crystals that revolve around the weapon and kept the rocks as they were before to keep the focal point on the double-pointed crystal and emphasize the wand's potent earth magic. Leslie was a klutzy upper-class Galician resident who was stricken with a case of bad luck for as long as she can remember. Prone to being an unintended victim in undesirable situations almost every day, she overthinks how her daily routine could suddenly go awry and attempts to take precautions in order to prevent such mishaps. Even so, she is not fortunate enough to avoid even a single stroke of bad luck at least once a day. Leslie has no memory of her parents nor has any known close relatives for she was raised by a banker named Uncle Sham, a leprechaun who resided in Galicia by disguising himself as a short human being to avoid scrutiny. Since she and her Uncle Sham were wealthy individuals, the former had no trouble getting what she wanted and was often invited by the Romanos family to their estate to have tea parties with their daughter, Irene, and several other upper-class girls in the town. Irene grew distant over time and preferred the company of her older brother, causing the tea parties to stop abruptly. By Uncle Sham’s direction, Leslie moved to Falconreach to find employment at its bank because he believed that settling in a smaller community might teach her the value of life beyond materialistic desires. The decision seemed strange to her, but she nonetheless enjoyed her independent life unaware that Uncle Sham was actually eyeing the gold in Falconreach’s Bank the whole time. Her klutziness, unfortunately, continued to follow her wherever she went. Five years later, she volunteered to join a group of local heroes in Falconreach that assist the influx of refugees with housing and adjusting to life in the city. There, she slowly developed a mature, studious side that led to an increase of good fortune. Sometimes, however, that side of her goes to her head, causing her to be occasionally uncooperative with decisions and rules made by figures of authority. One notable instance of this side of her personality was on one night when Leslie traveled to Swordhaven against the wishes of the leaders of her group to steal a book transcribing the history of Bladehaven to read it in hopes of finding instances where magic was used as a necessity to save lives even within the kingdom’s capital. Once she finally did take a copy from the city’s library, members of the Rose who were on patrol caught her and would’ve been taken into custody had it not been for David the Wanderer who rescued her on short notice. A select few individuals know that Leslie is actually capable of manipulating nature magic at her fingertips, but she never uses it for combat. As a part of her duties to her group, Leslie uses her magic for agriculture purposes. She is able to secretly grow small fruit trees and bushes that bear vegetables in a small garden at her cabin to provide to refugees who cannot afford basic necessities. Given that her group was founded under the condition where they do not get in the way with the Rose’s affairs, Leslie and her teammates are constantly stuck in a thin line between wellness and trouble and the former’s subtle defiance of authority is not helping matters. Only time is tell if one daring act could lead to the group’s demise, which is a factor that Leslie fears above all else. 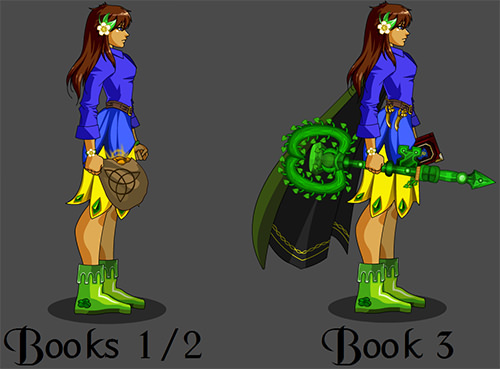 Two of my designs, the green leather boots and the Emerald Key that I drew last April, were used when I created Leslie. 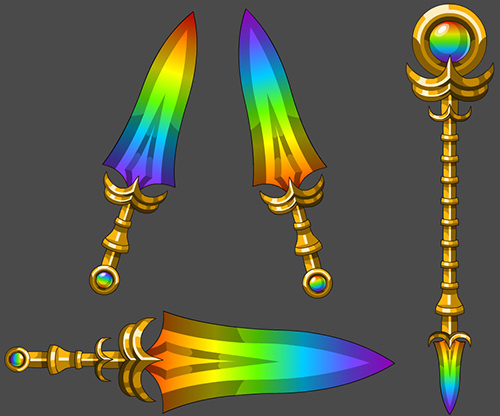 The rest were basically either recolored or replicated assets from AQW and the long-lost game, Bladehaven. Her outfit is a palette swap of Irene’s Book 1 attire prior to the Great Fire War and she dons the Glossy Flow hairstyle. Leslie rarely combs her hair despite her wealthy status because she wants it to “curve gracefully.” The book on Bladehaven that she is holding onto is a recolored version of the Vaxen LoreMaster Omnibus book with Bladehaven’s emblem on the cover. The emblem itself was recolored to match some of the colors on King Alteon’s armor in AQW so it would look as if the history of the city was written sometime after Swordhaven was formally established so its story would not be lost in the mists of time. That was also why Leslie stole that copy because in a way, she was terrified that The Rose would have parts of the book censored. In Book 3, Leslie dons a SureWould Camo Cloak that she found on a hike in the forest and uses it to blend in with a tree during a risky mission, but it only works for so long because there isn’t always one in sight to help her cover her tracks. In addition to the cloak, she carries a pair of Leprechaun's Curse daggers with her if she had to throw one at a rickety object so it could collapse on multiple foes at one time. Although the concept was simple, it took trial and error to decide what she will equip and what her background is like. More of it could be explored later if her adoptive guardian gets any bright ideas with the Falconreach Bank. You've made it to the end of the mystical road in the sky during the aurora borealis marking the first day of summer and for that, you are rewarded with this breath-taking sword/scepter/dirk that is capable of reversing any severe ailments inflicted on you. May it serve you well in keeping shady foes at bay. Your perseverance while traveling further down the mystical road in the sky during the aurora borealis marking the first day of summer is recognized by your shady foes when you obliterate their shadows with this breath-taking sword/scepter/dirk. Its pulsing light grows alongside your mental strength, a symbol of your passion to accomplish an out-of-reach goal despite the odds stacked against you. The mystical road that appears during the aurora borealis leads directly to the Mana Core where the Tier 3 weapons are located, but that's another story for Occavatra and co. once they, too, discovered how vital magic is to some cultures across the world including, of course, the Shapeless Empire.